Style up your wedding party with these fashionable accessories. 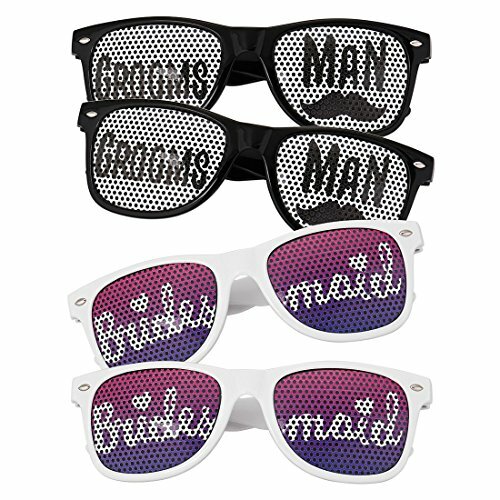 This set features 4 pairs of Wayfarer style sunglasses each with a wedding party label across the lenses. You get 2 white pairs for the bridesmaids, and 2 black pairs for the groomsmen. These make for a great photo opportunity and a fun party favor for your wedding party to remember that special day. Sunglasses are made with durable, waterproof plastic. Dimensions - Frame Size: 5.7 in (L) X 1.9 in (H), Arm Length: 5.5 inches. View selection menu carefully to check what you are ordering. Not all sets are exactly the same; please review product details and images for more information. *NOTE*: Due to differences between monitor displays, actual color may vary slightly from image. b.m.c is a registered trademark of Remi Collections LLC and is exclusively distributed by Bundle Monster. The b.m.c trademark is protected by US Trademark Law. ONE SIZE FITS MOST - Frame Size: 5.7 in (L) X 1.9 in (H), Arm Length: 5.5 inches. DISCLAIMER: stickers have minor impact on visibility. Dance floor supervision may be required.